While in school I went to a dressmaking evening class and learnt how to make a dress and a kilt and continued to make clothes for myself and later for the children. This was very enjoyable and economical. Funnily enough recently my husband brought two boxes of baby clothes down from the attic to sort for Caitriona’s baby and inside we found several little dresses I had made for her and some dungarees for Sinead’s son Sean when he was small. I haven’t made clothes for many years as my fabric love has gone in different directions. I like to try new crafts and sometimes to mix them together. I was once told not to mix crafts and that made me want to do it. It’s great fun and can produce unexpected results. I have embroidered on batik , mixed embroidery with patchwork and joined non matching pieces of printed fabric into a wall hanging. The sky is the limit for the fun with fabric. Sometimes my contrariness comes out in design. I love traditional quilts and need to make them to keep focused. There are so many colour combinations to vary the most basic designs and now and again I like to challenge myself to make something outside my comfort zone. I really love “wonky” wall hangings, pieces that are off centre, colours that don’t usually go together, flowers with falling petals etc. I know this drives some people mad ( some quite close to me) but it’s great fun. It doesn’t always work—–like the chopped up panel —-I killed it!! but it was worth a try and I might go back to it sometime. A lovely lady brought in an Indian quilt to show us and will lend it for the exhibition this June. She bought it very cheaply on the roadside in India. It is all hand patchwork and applique in tiny stitches and is hard to imagine how long it must have taken to design and sew. The backing looks like pieces of hessian joined together with a large stamp on the underside which suggests that it had been maybe a sack for grain or beans. This reminded me of my Aunt in Galway who was amazing at all arts and crafts. She bought flour in large sacks for her lovely bread, and then washed the bags for all kinds of use as it was lovely and soft and very strong. We have had a lot of new deliveries in the shop lately and I haven’t had time to try the new patterns yet as we’ve been busy with orders but will get to them. I found a photo of my grandson and a friend as children standing on a lovely tile pattern lino so am now working on a quilt of that pattern. 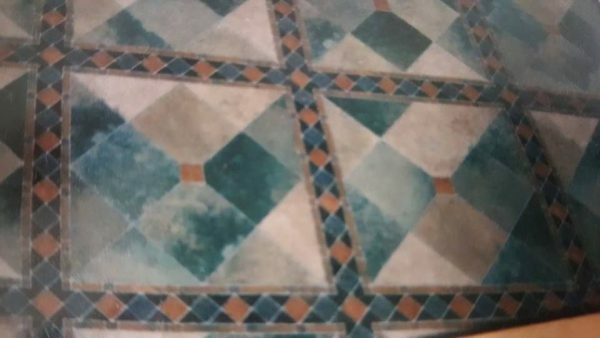 Its great to take ‘photo’s of floor or wall tiles as they can be a good base for patchwork. 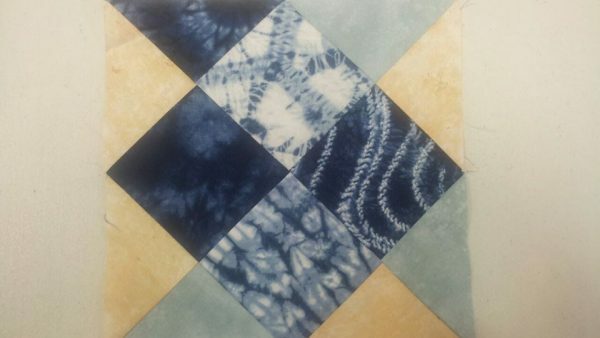 Here is the floor that inspired me and a block based on the floor using a shibori fabric charm pack which will be in the shop in September. I’m going to do a different sashing to the one on the floor pattern but I haven’t decided what I will do yet. 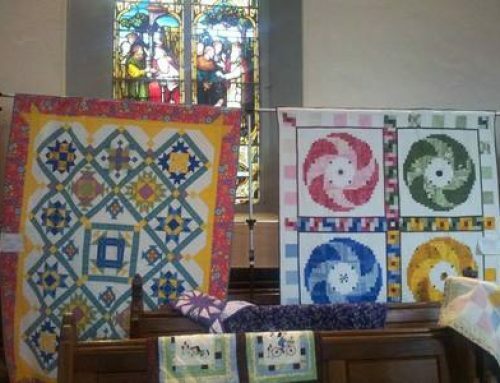 We are all looking forward to this years exhibition, called Newtownmountkennedy QuiltFest. It is a joint effort between us and the Wicklow Patchwork Group, of which we are members. The last joint one two years ago (we have the shop one each year) was amazing with quilts from experienced and very new quilters and I love them all. It is encouraging to see what can be done and to those who tell us they love it but can’t sew —-come and try and you will find you can and will love it more. 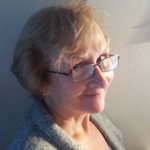 Tip — are you having difficulty threading a machine or hand sewing needle? Try cutting the thread at a slant, sounds mad but it works.